In the early civilizations, the undesired product soot was used in the ancient Egypt and China as a black pigment for writing letters. In the late 19th century carbon black started to be produced with the channel process. The industrial mass production started in the beginning of the 20th century, with the development of other carbon black production processes, mainly driven by expanding the tire industry. Today carbon black is a high-tech raw material with clear defined properties, widely used in various fields of applications, from pigment to electric conductive agent of high-technology materials. Carbon black is one of the darkest and most widely spread materials known. Chemically, carbon black is a colloidal form of elemental carbon consisting of 95 to 99% carbon. Made in specially designed reactors, operating at internal temperatures in the range of 2600° to 3600°F, different grades of Carbon black can be produced with varying aggregate size and structure. It is not the undesired by-product soot, which is known from chimneys or exhausts. Carbon black is an industrial produced raw material with clear defined properties like primary particle size, surface and structure. Carbon black is a high-tech product that can be manufactured reproducible with defined parameters/properties. Carbon black typically contains more than 95% pure carbon with minimal quantities of oxygen, hydrogen and nitrogen. The characteristics of carbon black depend mainly on the manufacturing process/method, and therefore carbon black is classified by the manufacturing process. Manufacturing methods include furnace, gas, lamp and thermal black processes. Above 98% of the world’s annual carbon black production is covered by the furnace black process. Feedstock base for all carbon blacks are hydrocarbons like, aromatic oils based on coal tar or crude oil. Main coal tar distillate for carbon black production is for example anthracene oil. Both groups have a high content of aromatic hydrocarbons in common. Further feedstocks are heavy petroleum fraction, distillation residues form oil refineries, and different oil mixtures. Further can be used natural gas, naphtha, gas oil and acetylene. The 2 main parameters for carbon black feedstock that are influencing the yield are BMCI (Bureau of Mines Correlation Index) and Sulphur content. The most important is the BMCI, a number correlated with the aromaticity of the feedstock. To evaluate the BMCI, the specific gravity and the mean boiling point are significant. High content of sulphur is undesired in carbon black feedstock, because sulphur content in the feedstock is correlated with the sulphur in carbon black. HOW IS CARBON BLACK PRODUCED? There are several processes for carbon black productions. In the furnace black process aromatic oils (based on crude oil) are cracked under high temperature in a reactor, producing carbon black and tail gas. After cooling, the carbon black is separated from the tail gas, densified and processed into pellets of varying grades/sizes. This process is the most widely used in the world comprising over 98% of all carbon black production, because it permits the to influence and control the main carbon black properties like specifically engineered aggregates of carbon particles that vary in particle size, aggregate size, shape, porosity and surface chemistry. The worldwide most common production process uses a closed reactor to atomize heavy aromatic oils under pressure and temperature controlled conditions. This feedstock is inducted into a hot gas stream and a preheated air stream where it vaporizes and then pyrolyzes in the vapor phase to form microscopic carbon particles. In most furnace reactors, the reaction rate is controlled by steam or water sprays. The carbon black produced is conveyed through the reactor, cooled and collected in bag filters in a continuous process. Discontinuous or cyclic process, with natural gas methane as the most commonly used feedstock, although higher grade hydro carbon oils are also used as feedstock material. The natural gas is injected into the inert atmosphere of the furnace where it decomposes into carbon black and hydrogen. It has the largest particle size and among the lowest degrees of particle aggregation or structure. Since it is made from natural gas, it is also one of the purest forms of carbon available on an industrial scale. The crude oil is vaporized in the channel black process and is fed to the burners together with the carrier gas. A specific influence on the structure of the carbon blacks produced in this way is not possible. Nowadays the channel black process is primarily used to manufacture carbon black pigments with very fine particles, which are primarily distinguished by their high content of oxygenic surface groups. This process is the oldest way to produce carbon black (formerly from oil lamps). The heating is conducted on a cast-iron pan with the feedstock. Radiant heat from the hood causes the feedstock to vaporize and partially combust. Most of it is converted into carbon black. 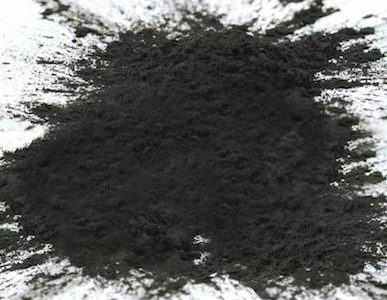 The particle size, structure and surface area of carbon black play a significant role in the material properties of rubber, plastics, inks, paint, coatings, cosmetics, fibres, paper, energy, foundry, metallurgic, friction and refractory products. The total market for carbon black was probably around 13 million metric tons in 2016. For this reason, carbon black is made in various grades to meet the varying material needs and specifications of manufacturers. The diameter of spheric particles is the fundamental property, which largely affects blackness and dispersibility when carbon black is mixed with resins or other vehicles. In general, the smaller the particle size, the higher the blackness of carbon black. Dispersion however, becomes difficult due to an increase in coagulation force. Primary particles – aggregates – agglomerates. Structure of carbon black shows the length of the chains of agglomerates. Like particle size, the size of the structure also affects the blackness and dispersibility of carbon black. Generally the increase of structure size improves dispersibility but lowers blackness. Carbon black with a larger structure in particular shows an excellent conductive property. Below two images taken by a Scanning electron microscope (SEM) show the structure of one Carbon Black grades in two different scales. The building of aggregates and agglomerates become visually visible this way. The specific surface area of a carbon black is mainly derived from the particle geometry using adsorption methods. Iodine adsorption, measured in mg/g, is the most common technique. Various functional groups exist on carbon black’s surface. The affinity of carbon black with inks or paint varnishes/resins changes depending on the type and amount of the functional groups. Carbon black, with a large amount of hydroxyl group given with oxidation treatment, has a greatly enhanced affinity to print inks or varnishes, showing an excellent dispersibility. The Picture below shows 3 different carbon black types with different surface areas influencing the blackness of carbon black. 3 different shades of black, depending on the surface of Carbon Black. Porosity effectively reduces the „weight“ of a given particle of carbon black. Therefore, for equal „weight %“ loadings higher porosity carbons increase the number of particles present in the compound reducing the inter-particle distances and greatly increasing conductivity. Porosity is often indicated by larger differences between NSA and STSA where NSA and STSA measure total surface area and external surface area respectively. Increases rate of moisture pickup (does not affect equilibrium moisture pickup). May affect the performance of compounds including other constituents of carbon black such as sulphur, ash, residue, etc. and its physical form i.e., powder or beads. Carbon black is available in powder and beaded form. However, bulk handling, economics, freight, cleanliness or a particular required property may mandate the use of a beaded black. When using beaded blacks, wetting/premix times should be extended as much as possible to ensure that the beads have been broken down. The compounder can anticipate dispersion to require more work when using a beaded black. However, this additional work can be offset by faster incorporation of the beaded black into the vehicle and significant improvements in handling and housekeeping. Aciniform: Shaped like a cluster of grapes. The spheroidal primary particles of carbon black are fused into aggregates of colloidal dimension forming an aciniform morphology. Agglomerate: A cluster of physically bound and entangled aggregates. See Test Method ASTM D 3849. 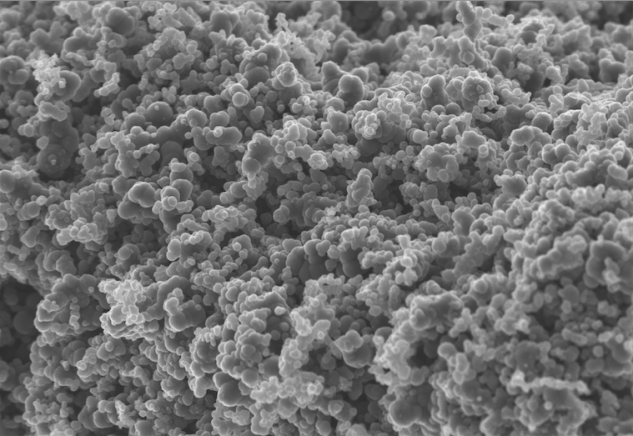 Aggregate: A discrete, rigid, colloidal mass of extensively coalesced particles; it is the smallest dispersible unit. Ash content: Content in % of ash in carbon black. See Test Method ASTM D 1506. ASTM D: The most important target values of carbon black are described by ASTM methods (American Society for Testing Materials). Carbon Black: An engineered material, primarily composed of elemental carbon, obtained from the partial combustion or thermal decomposition of hydrocarbons, existing as aggregates of aciniform morphology which are composed of spheroidal primary particles, uniformity of primary particle sizes within a given aggregate and turbostratic layering within the primary particles. Particle size and aggregate size (number of particles per aggregate) are distributional properties and vary depending on the carbon black grade. The particle and aggregate sizes vary greatly within a given grade of carbon black, the primary particle size is essentially uniform within an individual aggregate. 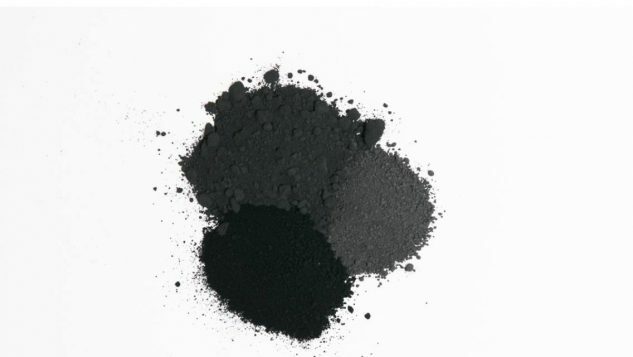 Carcass grade Carbon Black: A type of furnace carbon black having an average particle size in the range from 31 to 200 nm. Carcass grade carbon blacks are produced by the oil furnace process. The use of these grades in the rubber industry is not limited to the carcass portion of the tire. These grades are designated with an “N” first character and a second character of “1, 2, 3, 5, 6 or 7” in Table 1 of Classification ASTM D 1765. See Terminology ASTM D 1566 for the definition of carcass. CAS Number of Carbon Black: 1333-86-4: Unique numerical ident assigned by Chemical Abstracts Service. Compressed Oil Absorption Number (COAN): See oil absorption number of compressed sample, the preferred term. Fines content: That portion of pelleted carbon black that passes throught a specified sieves. See Test Method ASTM D 1508. Furnace Carbon Black: A type of carbon black produced by the decomposition reaction of hydrocarbons when injected into a high-velocity stream of combustion gases under controlled conditions. Hard Carbon Blacks: See tread grade carbon black, reinforcing carbon black, the preferred term. All carbon blacks provide some level of reinforcement when mixed in rubber. The amount of reinforcement is a function of the carbon black grade and amount used. See Terminology ASTM D 1566 for the definition of reinforcement. Heating loss: Mass loss in % when carbon black is heated at 125°C for 1h; the heating loss is primarily attributed to moisture content. See Test Method ASTM D 1509. Individual pellet hardness: The force required to fracture or crush a carbon black pellet. See Test Methods ASTM D 3313 and D 5230. 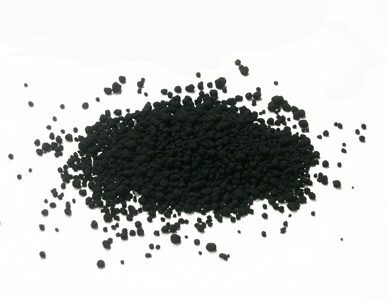 Iodine adsorption number: The number of grams of iodine adsorbed per kilogram of carbon black under specified conditions. See Test Method ASTM D 1510. Lot: A defined quantity of carbon black that is essentially uniform in composition and characteristics. Lot sample: A quantity of carbon black selected to represent a lot for testing purposes and taken in accordance with Practice ASTM D 1799 or D 1900. Mass strength: A measure of the tendency for carbon black pellets to pack together and to influence flow in a bulk handling system. See Test Method ASTM D 937. Microstructure: Arrangement of carbon atoms within a carbon black particles. Moisture content: The percentage, by mass, of water absorbed and adsorbed by carbon black. See definition of carbon black heating loss. According to ASTM D 1509. Nitrogen surface area (NSA): Nitrogen surface area of carbon black, defined by ASTM D 6556. Total and external surface area by Nitrogen Absorbtion. Oil absorption number (OAN): The number of cubic centimeters of dibutyl phthalate (DBP) or paraffin oil absorbed by 100 g of carbon black under specified conditions. The OAN value is proportional to the degree of aggregation of structure level of the carbon black. See Test Methods ASTM D 2414 and D 3493. Oil absorption number of compressed sample (COAN): The number of cubic centimeters of dibutyl phthalate (DBP) or paraffin oil absorbed by 100 g of carbon black after being compressed four times in a compression cylinder at 165 MPa (24 000 psi) under specified conditions. The COAN value gives some measure of the stability of the structure of the carbon black. See Test Methods ASTM D 2414 and D 3493. Oil furnace process: A process for producing furnace carbon blacks that uses oil as the source of hydrocarbons for decomposition by injection into a high-velocity stream of combustion gases. Oil or natural gas are typically used as combustion fuel to create the high-velocity stream of combustion gases, although other fuels may be used. 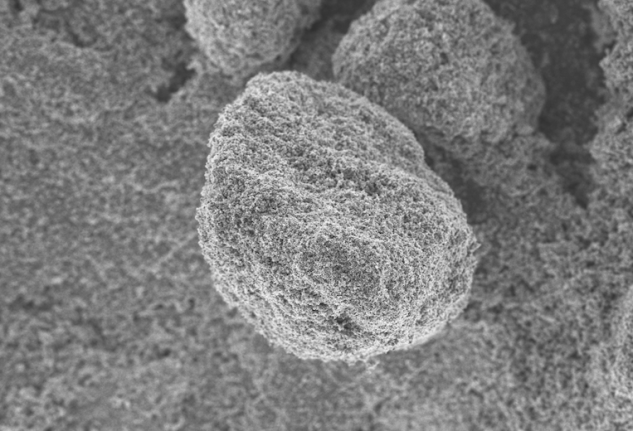 Particle: A small spheroidally shaped (paracrystalline, non-discrete) component of a carbon black aggregate; it is separable from the aggregate only by fracturing. Particle diameter: Arithmetic average of the diameters of particles within a carbon black aggregate as measured by electron microscopy. See Test Method ASTM D 3849. Pellet: A relatively large agglomerate mass that has been densified in spheroidal form to facilitate handling and processing. See Test Method ASTM D 1511. Pellet size distribution: The percentage, by mass, of carbon black retained on each of a specified series of sieve screens arranged with progressively smaller openings. See Test Method D 1511.
ph-Value: According to ASTM D 1512. Pour density: Mass per unit volume of carbon black, determined in kg/m3. See Test Method ASTM D 1513. Reinforcing Carbon Black: See tread grade carbon black, the preferred term. All carbon blacks provide some level of reinforcement when mixed in rubber. The amount of reinforcement is a function of the carbon black grade and amount used. See Terminology ASTM D 1566 for the definition of reinforcement. Rubber Carbon Black: The nomenclature currently used for the rubber grade carbon blacks was instituted by the D 24ASTM Committee on carbon black in 1968. It consists of a prefix letter followed by a three-digit number. The prefix, either N or S indicates whether the grade is a (N)ormal or a (S)low curing material. When the system was developed channel blacks were still commonly used and were slow curing. Afterwards, a fifty-fold increase in natural gas price ended rubber grade channel black production. For a time furnace grades treated to emulate the cure characteristics of channel were available. These too have largely disappeared leaving little need for or use of the „S“ prefix letter. Consequently, most (if not all) currently active rubber grades carry the prefix „N“. Semi-reinforcing Carbon Black: See carcass grade carbon black, the preferred term. All carbon blacks provide some level of reinforcement when mixed in rubber. The amount of reinforcement is a function of the carbon black grade and amount used. See Terminology ASTM D 1566 for the definition of reinforcement. Soft Carbon Black: See carcass grade carbon black, semi-reinforcing carbon black, the preferred term. All carbon blacks provide some level of reinforcement when mixed in rubber. The amount of reinforcement is a function of the carbon black grade and amount used. See Terminology ASTM D 1566 for the definition of reinforcement. Statistical Thickness Surface Area (STSA): The external surface area of carbon black that is calculated from nitrogen adsorption data using the de Boer theory and a carbon black model. See Test Methods ASTM D 5816- 6556. Structure: The quality of irregularity and deviation from sphericity of the shape of a carbon black aggregate. Sulphur content: Content in % of sulphur in carbon black. See Test Method ASTM D 1619. Surface activity: The inherent ability of the carbon black surface to interact physically or chemically, or both, with rubber or other molecules. Unfortunately there is no direct method for measuring carbon black surface activity. The term refers to the chemical reactivity of the surface. Surface activity is influenced by the graphitic plane orientation as well as the number and type of organic side groups. On a molecular level, carbon black is composed of amorphous graphite layer planes created from the condensation of aromatic rings. The edges of such planes have unsatisfied carbon bonds which can act as chemical reaction sites. The reaction time for the production of thermal black is long in comparison to the furnace black process. Long reaction times combined with the high temperature required for the thermal decomposition of natural gas feed stock (1300 ̊C) allows the graphite layer planes of thermal black to become highly ordered so that only layer plane surfaces are at the surface of the particle. As a result, no unsatisfied carbon bonds at the layer plane edges are exposed and therefore no potential reaction sites for elastomer interaction are present in thermal black. Conversely, the shorter reaction times used in making furnace black produce layer planes at the surface which are less ordered, resulting in numerous sites for chemical bonds with elastomers. Recent scanning tunneling electron microscopy (STM) studies, which characterize the surface of carbon black, clearly support the fact that larger particle size carbon blacks like thermal black tend toward a more organized surface structure with fewer active sites. The formation of thermal black occurs in the absence of flame or air while furnace black is generally the product of incomplete combustion of petroleum refinery residues. As a result, furnace blacks contain numerous types of organic functional groups such as phenols, hydroxyls, lactones and quinones which also contribute to the level of surface activity. The same organic functional groups are virtually absent from thermal black. Carbon blacks with a high amount of surface activity often provide high reinforcement. While thermal black does impart some degree of reinforcement to elastomers it is most often referred to as an inactive or non-reinforcing black. The influence of carbon black on rubber can best be described in terms of processing and vulcanizate properties. In choosing carbon black(s) for an elastomer formulation, the grade of carbon black and the degree of loading must be taken into consideration. The general effects of carbon black on any given rubber property can be summarized according to surface area (particle size), structure and loading level. Surface area CTAB: (Formerly Test Method ASTM D 3765) Has been withdrawn. The CTAB value may be estimated from the STSA value using Eq 1. The equation is based on a linear regression of the STSA and CTAB measured values of the SRB 5 standards. CTAB 5 STSA * 1.0170 1 2.6434. Target value: A consensus value for selected primary properties on which producers center their manufacturing process and users center their specification. Target values for carbon black properties are shown in Classification ASTM D 1765 for most rubber grade carbon blacks currently in commerce. Thermal Carbon Black: A type of carbon black produced under controlled conditions by the thermal decomposition of hydrocarbons in the absence of air or flames. These grades are designated with an “N” first character and a second character of “8 or 9” in Table 1 of Classification ASTM D 1765. Tint strength: The ratio, expressed as tint units, of the reflectance of a standard paste to a sample paste, both prepared and tested under specified conditions. See Test Method ASTM D 3265. Toluene discoloration: The transmittance, at 425 nm, of the filtrate obtained from the toluene extract of carbon black, compared with that of pure toluene. See Test Method ASTM D 1618. Tread grade Carbon Black: A type of furnace carbon black having an average particle size in the range from 1 to 30 nm. Tread grade carbon blacks are produced by the oil furnace process. The use of these grades in the rubber industry is not limited to the tread portion of the tire. These grades are designated with an “N” first character and a second character of “0, 1, 2, or 3” in Table 1 of Classification ASTM D 1765. Typical value: A consensus value for those carbon black properties that are not specifically targeted for control in the manufacturing process and that are somewhat dependent upon the targeted properties. Typical values for carbon black properties are shown in Classification ASTM D 1765 for most rubber grade carbon blacks currently in commerce. These are consensus values based upon the range in values supplied by the manufacturers. Typical values are useful in making comparisons between grades but they are not the set-point targets for the process and may be expected to differ significantly between producers. Weight mean particle size: ratio equal to the sum of individual particle diameters, each raised to the fourth power, divided by the sum of the individual particle diameters, raised to the third power.